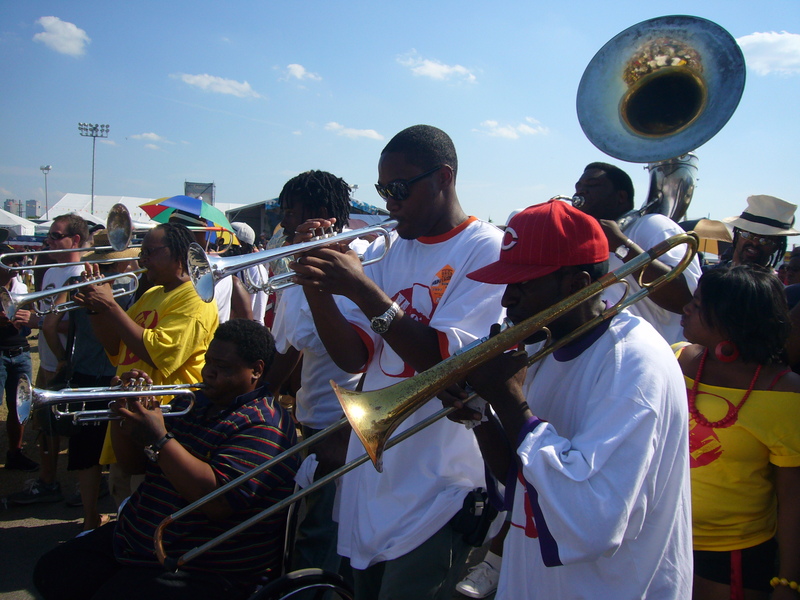 The Hot 8 Brass Band began as the Loony Tunes in the early 1990s, formed by students at Alcee Fortier High School in Uptown New Orleans, including Jerome Jones (trombone), Jacob Johnson (trumpet), Harry Cook (bass drum), and Bennie Pete (tuba). Loony Tunes played together for several years after graduating from high school before merging with the High Steppers to become the Hot 8. The High Steppers were a downtown group whose members included Derrick Tabb (snare drum), Tannon Williams (trumpet), and Herb Stevens (trombone). Tabb soon left to join Rebirth Brass Band, and Tannon Williams joined the Soul Rebels Brass Band. Dinerral Shavers (snare drum), Joseph Williams (trombone), and Shamarr Allen (trumpet), musicians from New Orleans’ Ninth Ward, joined the band, followed by Raymond Williams (trumpet). Within two years of releasing Rock With the Hot 8, the band would lose both Joseph and Dinerral to violence. In August 2004, Joseph was shot and killed by New Orleans police officers outside a convenience store in the Treme neighborhood. Joseph’s death led Walter Ramsey and other members of The Stooges to write and record “Why Dey Had to Kill Him?” and led many brass bands to pay tribute to the trombonist in shows immediately following the incident. Hot 8 trombonist Jerome Jones also composed “You Bang, We Bang Bang” in honor of Williams. Like “Why Dey Had to Kill Him?”, “You Bang, We Bang Bang” incroprates the sounds and themes of hip-hop to express grief over Williams’ death and frustration that the officers involved were acquitted of wrongdoing. In December 2006, Dinerral Shavers was shot and killed on Dumaine Street in the Treme neighborhood of New Orleans, the victim of gunfire intended for his stepson Thaddeus. The Hot 8 Brass Band continues to play Dinerral’s and Joseph’s tunes in their live performances. Musically, Hot 8 embraces many of the hip-hop elements characteristic of young brass bands in New Orleans. Riff-based tunes feature prominent bass and drum lines, and the band typically dresses in oversize t-shirts and baggy jeans on stage. In addition, the band has worked with Dr. Michael White on more traditional repertoire. This collaboration has helped Hot 8 expand their audience, as well as the range of venues and functions at which they play. Like many New Orleans brass bands, Hot 8 has been featured on HBO’s Treme. They toured with Lauryn Hill in the spring of 2011, and regularly tour Europe. Their second album, The Life & Times Of, was released in 2012 on the Tru Thoughts label. The band currently plays a weekly Sunday night show at the Howlin’ Wolf Den in New Orleans’ Central Business District (CBD).